Some clouds in the morning will give way to mainly sunny skies for the afternoon. High 78F. Winds light and variable..
Clear skies with a few passing clouds. Slight chance of a rain shower. Low 52F. Winds SW at 5 to 10 mph. A month ago, Chris Daughtry rolled into Knickerbockers in a shiny new tour bus befitting a man who has sold 2 million copies of his debut album. Inside the bar, a fully stocked stand sold T-shirts and other paraphernalia as if the show was being held in an arena. By 9 p.m. that night, the place was packed with 400 people — the concert was sold out weeks earlier, minutes after tickets were made available. Five days later, The Bottle Rockets took the Knickerbockers stage. There were half as many people in the club as were at the Daughtry show, no tour bus, no souvenir stand. After 14 years, the St. Louis-based band is still in the van and selling a few thousand records every year. 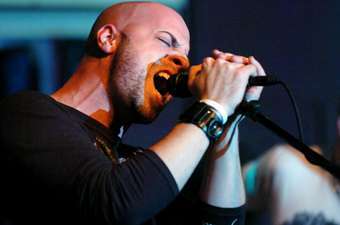 The two shows at the Ninth and O Street club that week provided a microcosm of the fractured music industry — Daughtry representing “American Idol,” the hottest show on television that is providing instant success for its top performers, and The Bottle Rockets, an example of the tumultuous state of the rest of the music business. Now in its sixth year, “American Idol” is seen by an average of 32 million people each episode this season. That kind of repeat mass exposure has turned its winners, runners-up and 2006’s No. 4 Daughtry into stars. Idol alumni include country singer Carrie Underwood, Clay Aiken, Kelly Clarkson and last year’s winner, Taylor Hicks. "Auditioning is reality,” “American Idol” judge and co-owner Simon Cowell told the New York Times last week. “You win 'Idol,' the odds are you're going to get a career out of it." Idol winners are immediately signed to Cowell’s record label, J Records, which is distributed by Sony-BMG. He says the Idols have sold 50 million records in the last five years. Even “disappointing” Idol sellers, like Hicks’ self-titled debut that was released in December, almost instantly go gold, selling more than a half a million copies. William Hung, arguably one of the very worst to audition for “Idol,” sold nearly 200,000 copies of his album. Multiplatinum sales and the instant crowds on tour are an anomaly in today’s music world. That sentiment is largely shared throughout the music industry. At last month’s South By Southwest Music Conference, there were plenty of snide remarks directed at “American Idol,” some certainly out of jealousy, but others based on the perception that the television show was finding the top musical talent in the country. Statistics from SoundScan bear out Henneman’s point that anything not “American Idol” is in trouble. Mired in a seven-year slump, CD sales are off more than 20 percent in the first three months of 2007. Even the Idols aren’t immune to the CD slump. In one of its weeks at No. 1, “Daughtry” sold just 65,000 copies. That’s a sharp contrast to the hundreds of thousands that a No. 1 album sold in prior years. Downloading from the internet, which is the future of music sales, has increased dramatically. But not nearly enough downloads of single songs have been sold to offset the drop in sales of CDs, which still account for more than 80 percent of music sales. So if they’re not on “American Idol,” how does a new artist, band or singer become a star in 2007? Traditionally, record companies broke bands via radio, print publicity and touring. Now plans include street-level marketing, placing songs in movies and on TV shows and “seeding” the Internet. Major record labels looking for new bands and solo artists go to MySpace and similar Internet sites not only to listen to songs, but to see how many “friends” are on the page. Get 30,000 or so signed up, and you might get a call from a label talent scout. That’s far easier said than done. More than 2 million MySpace pages feature music, making it very difficult for any one to break through. That said, there have been some Internet music sensations, including OK Go, which became a buzz band thanks to its innovative video that went viral last year. But will the Internet ever create a huge breakout hit that turns an artist into a star, like the Rolling Stones’ “Satisfaction,” Bruce Springsteen’s “Born To Run” or Nirvana’s “Smells Like Teen Spirit”? Industry veterans have their doubts. The Internet also presents a double-edged sword for touring acts. While efforts like sending personal invitations to people with MySpace pages who live within a certain distance of a club can result in a handful of folks turning up for a show who otherwise wouldn’t have gone, just as many might stay away because of what is offered on the Web. Making the jump out of clubs and small halls into arenas, traditionally seen as the mark of a successful touring band, is also more difficult today than ever. A look at the touring industry finds a few dozen top-selling acts, which either cater to baby boom audiences or are Top 40-style artists, that play large arenas. Meanwhile, there are very few mid-level artists who play to from 5,000 to 10,000. In part, that’s because of the high cost of touring today. With guarantees in the $40,000 range for a band that will draw 3,000 or 4,000 people and another $25,000 in costs to put on the show, those mid-sized concerts become high risks for promoters and arenas. That not only has put small arenas like Pershing in a pinch to book concerts, it’s putting more of a squeeze on the upcoming acts, which are not given the time and resources to develop into top-level stars. Touring remains critical to any band’s success. With the decline of CD sales, record labels are beginning to write contracts in which they get part of a band’s touring revenue. But other types of exposure are becoming increasingly important. The Shins are an example of a band that has had its career jump started through a movie. The New Mexico band had two songs, “Caring is Creepy” and “New Slang,” personally selected by director Zach Braff for the 2004 film “Garden State.” That significantly increased the band’s visibility. Now the band is among the most popular indie pop/rock acts. Lazlo Bane has had a similar experience on television. The band’s song, “I’m No Superman,” is the theme to Braff’s NBC comedy “Scrubs.” Lazlo Bane’s Chad Fischer said the network didn’t want any song — a trend in the TV industry — but Braff “pushed and pushed” for it. Today, Fischer credits Braff not only for getting the song on the air, but for the band’s continued existence. “Oh Lord,” a song by Roche’s client Ken Will Morton, has just been selected for use in an episode of “Deadliest Catch,” a popular Discovery Channel program. Roche said that episode will probably air about 50 times on the cable TV network, which means the Athens, Ga., singer/songwriter will get some money upfront, receive checks in the mail for use of the song on the repeats and, hopefully, some valuable exposure among people who otherwise would never hear any of his music. Satellite radio is also providing exposure for artists who cannot get on the air on commercial terrestrial radio. Between them, XM and Sirius satellite radio have about 20 million subscribers. While that means only a few hundred to a few thousand people may have the service in a city, satellite radio play has a direct impact on bands. Perhaps, Henneman and Roche suggest, the definition of success needs to be changed in a world in which DVRs, video games, high-definition TV, DVDs, movies and other forms of entertainment compete with music. If that indeed is the case, then “American Idol” and the stars it generates as the biggest hit in reality television, isn’t close to reality. It’s a multimillion-dollar fantasy. Reach L. Kent Wolgamott at 473-7244 or at kwolgamott@journalstar.com. Jeff Korbelik contributed to this story.